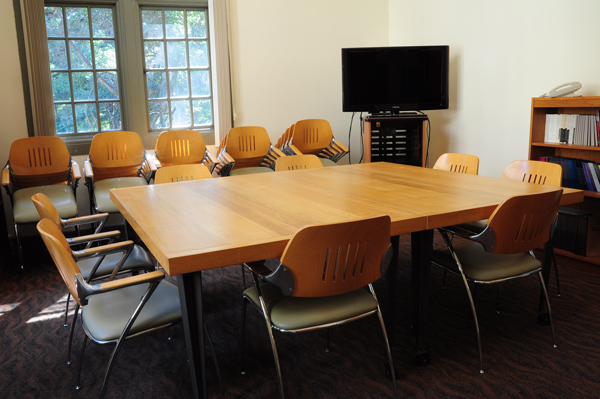 The Townsend Center meeting room facilities may be requested by University of California groups for humanities-related events such as lectures, research workshops, and colloquia. Please note the Townsend Center is not a complete conference facility and is unable to accommodate large-scale full-day or multi-day events. The Townsend Center does not provide kitchen space for event use. Technical assistance, such as computer networking and video or audiotaping, should coordinated directly with ETS. The Geballe and Seminar Rooms may be reserved Monday through Friday from 8:30am – 5:00pm. After 5:00pm will include a surcharge. Weekend events are approved on a case by case basis and will include a surcharge. No food or beverage may be served in the Geballe Room. If your event has any food or beverage, you must add the Seminar Room to your rental. The time of your reservation request should include the time needed for pre-event set up and post-event clean up. The Townsend Center does not provide technical support. Please contact ETS for audio/visual support needs. The Townsend Center does not have a kitchen for event use. The Townsend Center rooms are not available most Tuesdays before 4 p.m.
Reservations may not be booked more that four months in advance. The Townsend Center cannot accommodate large-scale full-day or multi-day events. Cancelations must be made at least 24 hours prior to the event start time or incur a charge. Failure to return rooms to their original configuration and/or remove trash and posted signage will result in a charge. The Townsend Center does not provide technical assistance or event support. The Geballe Room set up is traditional lecture style with a podium at the front of the room and two conference tables for panel discussions (see photo above). Your event organizer is responsible for your event set up, any modifications to this set up, equipment testing, and returning the room to its original state if this default setup is changed. It is your responsibility to ensure that the rooms are cleaned up at the end of the event. You are responsible for removing all trash and any posted signs from Stephens Hall. Trash should be placed in the dumpster located in the courtyard behind Stephens Hall (past the Ethnic Studies library). Catered receptions are permitted in the Seminar Room only; no food or drink set up is allowed in the Geballe Room. If you are planning a reception, you must request use of the Seminar Room at the time of your original reservation. You are responsible to responsibly dispose of and remove all trash, including food, food containers, bottles/cans. You are welcome to use any caterer you wish. For reference, this is a list of Townsend Center approved caterers. Alcoholic beverages require an Alcohol Permit from UCPD. The UCPD-approved form should be submitted to the Townsend Center before your event. One podium microphone, an LCD projector, and up to four table microphones are available in the Geballe Room for use at no additional charge by request on the room reservation form. You must provide your own laptop and any necessary adaptors to connect to the projector. The Townsend Center does not provide a technical assistant. Any additional technology assistance or equipement should be coordinated with ETS. All campus wireless networks (AirBears2, CalVisitor) are available in the Townsend Center. AirBears2 access requires users to have an active CalNet ID or a currently valid guest account username and password. Submit an online Reservation Request Form. Phone and email reservations or inquiries about availability will not be taken. You will receive an email to confirm the status of your reservation request within seven business days. Your reservation is not finalized until you receive this notification. You are responsible for any damage to equipment, building, and furnishings incurred during the event. Disability access to the Townsend Center is available via the corridor that leads from the Stephens Hall Archway though the Professional Development Program to the terrace outside the Center. Restrooms are accessible via elevator. If your event is cancelled, please notify us as soon as possible. Cancellations that are made less than 24 hours (weekday reservation) or 48 hours (weekend reservation) before an event may be subject to a fee.